ELLERBE — Registration is ongoing for the fourth annual Hot Mamas Softball League. The league is designed for women ages 35 and up. Play begins June 13 and the season will run up to six weeks, ending with a championship tournament. Players need to provide a driver’s license and $20 along with completing the form at Ellerbe Town Hall on Page Street in Ellerbe. The registration deadline is 4:30 p.m. on Tuesday, June 2. 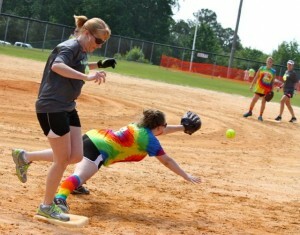 Hot Mamas Softball League is a league with a goal of providing an outlet for playing softball for women 35 and older. The mission of this ladies-only softball league is to enjoy exercise, fun and Christian fellowship with other women. Hot Mamas Softball League is seeking nominations for league commissioner. Please forward your nominations to Gay Garris Rhyne at rhynesden@yahoo.com or via the Hot Mamas Facebook page. We have a selection committee and will take all suggestions under consideration.